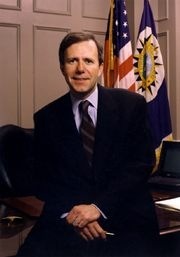 HispanicNashville.com: NASHVILLE MAYOR BILL PURCELL: "I AM VETOING ORDINANCE 1185"
NASHVILLE MAYOR BILL PURCELL: "I AM VETOING ORDINANCE 1185"
"The great overarching truth in our success in this still new century is that we are a welcoming, inclusive, and friendly people and place." English is our language. It has been so since before the city existed more than 200 years ago. It is the language we use to conduct the city’s business. In order to get ahead in Nashville a person needs to be able to speak English. This has been the case for more than 200 years. It is not going to change. We don’t need a law that will make it harder for a police officer to do his job, for a school teacher to teach or for a doctor to help a patient. This ordinance was introduced last September and for the last six months the sponsors have been twisting arms and trading votes to get it passed. Some sponsors say it is an important law while other sponsors say it has no effect at all. The truth is that no one knows how this law may ultimately be interpreted. If this law takes effect, this city will be engaged in years of lawsuits testing the effect and constitutionality of the ordinance. That means hundreds of thousands of dollars in legal fees whether we win or lose, for no good reason. This is not who we are. At the heart of this ordinance is the issue of immigration. We are dealing with that issue by supporting the deportation of illegal aliens who commit crimes. But this ordinance goes beyond illegal immigration to put at risk our community and its ability to welcome and work with those people who come to our city legally and want to be a part of our city. The Legal Department is clear in its opinion today that advised me that this ordinance is unconstitutional. The ordinance states that “all communications . . . shall be in English.” The exceptions are so broad that there is no way to know what is and is not allowed. What do we do when a Kurdish or other refugee wants to take an English class at the Cohn Adult Learning Center? What do we do when a Japanese company wants to find out about economic development opportunities? What do we do when a foreign tourist wants to find out how to get to the Parthenon? What do we do when someone who only speaks Spanish wants to report suspicious activity in a neighborhood, or a codes violation, or a pothole? This ordinance does not reflect who we are. When the waves of immigrants in the 19th and 20th centuries came to Nashville, they became part of our community. Germantown and the Oktoberfest are reminders of those immigrants.. Most recently the NHL has brought people from all over the world to our city to work and to play. Last year, the Celebration of Cultures at Centennial Park attracted 15,000 visitors to celebrate the diversity of the many communities and ethnicities in our city. Last year Nashville was chosen as one of three cities to host a World Cup soccer exhibition. Last year we welcomed the Greek Orthodox Church to a national convention here in Nashville, the most successful in history. Then we welcomed Hadassah. This year we are planning to welcome a new Japanese Consulate to our city. In April I will lead a delegation of Nashville business leaders to what is now the fastest growing economy in the world. The great overarching truth in our success in this still new century is that we are a welcoming, inclusive, and friendly people and place. If this ordinance becomes law, Nashville will be a less safe, less friendly, and less successful city. As mayor, I cannot allow that to happen. Therefore I am vetoing Ordinance 1185 and returning it to the Metro Council where I hope it will remain never to be seen again and that we can turn our full attention once again to education and public safety and quality of life which are the real work of a city and should be the work of its leaders now and forever.